MAYHEM: Normal Families Eat Toast for Breakfast. At left, Anna. Lovely Anna. I consumed Anna wholesale during a semester when I had three lit classes. It was the book I waited until bed to read. It was engrossing. It was my first Tolstoy. There will never be another first Tolstoy for me and that readers is a damn shame. My heart was young and my illusions not yet driven out of me. The immersion that I felt at reading after Anna and Count Vronsky and Frou Frou (Vronsky's horse) was wonderful. I even loved the intricacies of Levin's problems in running the estate (land poor - cash flow is a beast when you run a plantation). It was if I too was in the summer and the meadow was high and lush and anything - even things forbidden by convention - were possible. When the book was in winter, I felt the winter as the cold clarity of the first sharp breezes taking you by surprise in late October. I have a line in a story which I use as the title of this post. It is a terrible homage to Tolstoy and Anna but one nonetheless. Normal people eat toast and drink coffee in the morning. I once married a girl that drank diet coke for breakfast. That turned in the twisted way you'd expect given the normalcy of toast and coffee. I like toast. It is a wonderful item when done well. I love when the toasted part is good and the outside of thick bread is crisp and dark gold while the inside is warm and not yet dry. I love the way butter sits on toast at first working out a compromise I can hear the dialog: "Come on, get on with it. The dutch brown parts are fine. Just slather them a bit and move on. It'll be fine." I think toast has a Jackie Gleason sort of quality. When it is good, it is surprisingly good. When it is bad, it's still toast and that isn't too far from the mark. I'm writing - a little about normal people and their toast. Well, I'm writing more about not normal people (not normal to you, dear reader unless you live near Valentine, Nebraska and see your neighbors regularly at least once a month). Now, if your banker slept with your wife then his bank called the note on your loan, do you think you might shoot him? Everybody would know, wouldn't they. Suppose no one thought it out of line - even your brother the sheriff. How do you think the murder would be perceived? "He had it commin'?" or "Law and order first?" Yes, I'm inclined to go with "he had it commin" which means the shooting cannot be the major line of conflict. Oh, it's a contributor - sure. A big one. It cannot however be the most significant piece. What is? I think in this case it has to involve family. I think it has to involve a betrayal of a personal code of conduct held by the protagonist himself. I think he has to cross the line - and shooting the banker probably isn't that line. I hope you're writing. 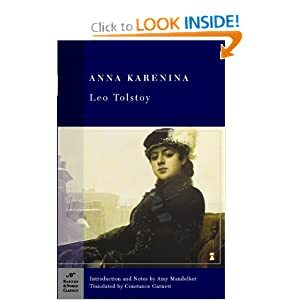 If you could use a summer read as you work on that tan (having become the wildly successful best-seller engine you are ) please consider Tolstoy's Anna Karenina. She's all that and more. Bad girls sometimes are bad because they are not quite right. Remember that. Anna is such a wonderful character. She's the sort that I don't imagine even our best actresses can fully embody. The text and her story is so rich. Now, the Snoopy pawput theatre version is quite good, too. ( Old Peanuts fan).